Synopsis: With a clue left behind by the recently deceased M, Bond uncovers a link to a sinister organisation known as Spectre. While the new M battles to keep MI6 afloat from sources at home, Bond must go it alone and uncover the dark truth behind Spectre and its leader, Franz Oberhauser. Review: How do you top a film that smashed box office records for the franchise, won two Oscars and was hailed by many as one of the best Bond films ever made? Well quite simply, you rehire the same director who brought us Skyfall and ensure that the steely blue eyed Daniel Craig is back on board as the man with the license to kill, globe-trot like never before and up the stakes considerably. Skyfall certainly raised the bar after the less than stellar effort from 2008 (which shall not be named) but with this newest addition into the long running franchise, it proves once again that the accuracy of this franchise is right on point once more, and with this new film we may have our best film of the franchise, certainly the best film of Daniel Craig’s tenure as Bond. If this is his final run as Bond, then he can certainly say he went out on a massive high note. 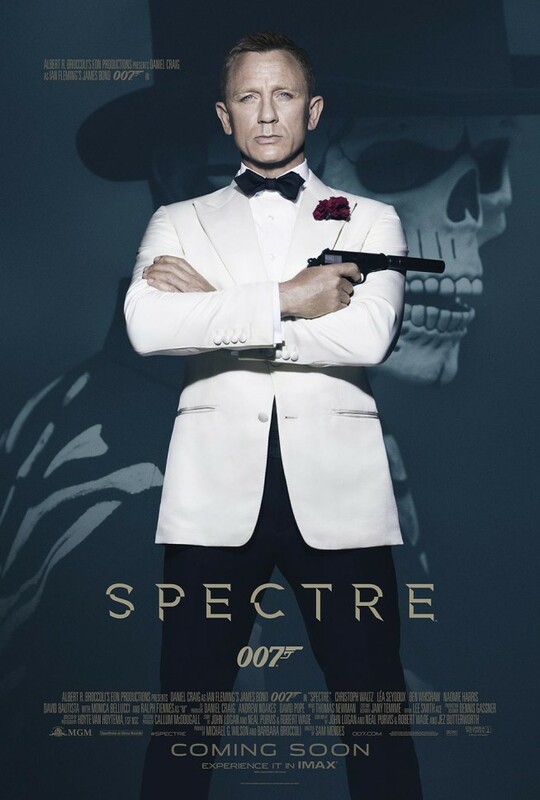 Carrying on from the events of Skyfall, from the wreckage of Bond’s childhood home comes a dark clue and it is one that leads Bond to the dangerous organisation known as SPECTRE, making its triumphant return to the franchise after a lengthy absence. Events that were set in motion from the previous films have come full circle for Bond, and now Bond has to face off against this menacing organisation and its all powerful leader, Franz Oberhauser, who has some close personal connections to Bond and in typical Bond fashion, there is a plan that needs to be foiled, by forces both at home and abroad. The exact same team that wrote Skyfall, Neal Purvis and Robert Wade, again joined by John Logan must have thought how on earth could they beat what they achieved in 2012? Well whatever were the results of their super secret script meetings, they pulled it off and in some style with one of the best Bond scripts in recent times. With an incredible opening scene set in Mexico, that surely ranks amongst the series best, to an intense finale in North Africa. The film boasts ar remarkable set of locations. Sam Mendes knew what worked with his previous Bond picture, and upped the style and then some. The dialogue is sharp, witty when it needs to be, but most importantly of all, keeps the audience engaged, which in no small part helps due to the magnificent cinematography, this time by Hoyte van Hoyetma. Like Skyfall, visually the film is breathtaking with some more excellent directing by Mendes. With the great story comes great characters, Craig remains electric as Bond, and the rest of his ensemble cast all bring their best performances to their respective roles. Having taken over the role as M, Ralph Fiennes shows he is more than capable of filling the role that Judi Dench played so magnificently for so many years. He had enormous shoes to fill, but he filled them and then some! With Ben Whishaw and Naomie Harris both impressing in their roles once again as Q and Moneypenny respectively. But it’s not out with the old and in with the new entirely as the new incoming cast certainly shine arguably the brightest. The identity of Waltz’s character has been the subject of much scrutiny (saying nothing…) the two time Oscar winner certainly demonstrates his great ability in an extraordinary performance. Equally magnetic and brilliant is Lea Seydoux, one of our two Bond ladies, who shows she’s more than capable of being a badass whilst when wearing an evening dress, while Dave Bautista brings his strength and silent presence in the form of ruthless henchman Mr Hinx. Yet for all the greatness with the new characters, there are some frustrations with Monica Belluci’s Bond lady being almost criminally underutilised, while other characters feel somewhat underdeveloped and their plot lines left a tad unexplained as to their true motivations. Yet take nothing away from Mendes and his team. The gauntlet they had set themselves after Bond’s 23rd outing was a big one, but they absolutely rose to the challenge and in terrific style. The series has arguably never been stronger and firing on all cylinders, and it will take a brave soul to step up to the plate to take on Bond 25, cos the bar has been raised once again, almost higher than never before. Although next time, a better theme song would be most welcome! With some stellar acting Craig, Waltz and Seydoux, whilst remaining visually beautiful with some extraordinary set pieces and some tremendous directing, the franchise is all guns blazing, and is not going to miss! What a rocking review, this makes me even more excited to see it. I’m planning on seeing it in the next week or so and it sounds like I’m in for a treat. I think Waltz and Bautista played their roles brilliantly. The scenes in the boardroom, Rome, train and Tangier were all fantastic. Mr Hinx draws a big comparison with Jaws I think, being big and silent and all that. I do hope that Craig and Mendes come back for one last outing. Liked your review man! Agree with a lot of it!